Many people think that since the advent of the computer keyboard handwriting is a skill of the past. Handwriting however will always be a necessary skill and it is important that children learn the basic handwriting skills at a young age. There are three main components to handwriting, no matter what style is being taught. These are size, letter formation and spacing. The formation (or form and slant) of specific letters depends on the style of writing being taught. Consult your child’s teacher if you are not sure which style of writing they are learning. The most important aspect of formation for your child to learn is the starting and stopping point of each letter. This will be the same no matter what the style. When starting out, encourage your child to trace the letters with his/her index finger before beginning writing. Your child may not know which hand to write with at the beginning. This is not something to worry about as sooner or later they will settle on a preferred hand. Your child’s posture and paper position both have a bearing on correct letter formation. When writing your child should be sitting up straight with both feet flat on the floor. The paper should be at a 45 degree angle toward the writing-arm side of the body. Letter size is generally the same across the different writing styles. Similar shaped letters should be the same height. Small letters e.g. a,e,n,r,v etc. should be half the size of the ascending letters (b,d,h,k,l,t) and descending letters (g,j,p,q,y). Proper proportion can be taught using special handwriting paper with lines to show the size of the letters. Proper spacing between both letters and words is also important. This should remain consistent throughout the writing process. When children are first learning to write they can measure the space between words with their small finger. Another important aspect of good handwriting is proper grip of the pencil or pen. Many parents worry that their left-handed child writes awkwardly or uncomfortably, and just have poor handwriting in general. 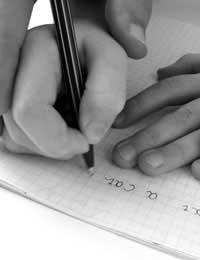 If your child is left-handed they may have difficulty monitoring their handwriting as their hand covers their writing. Because of this, left handed children often develop poor writing habits, such as bad writing positions or the wrong type of pencil grasp. When helping your left handed child to write ensure that the paper is positioned completely left of your child’s midline. When writing, your child should never cross over the midline. Try to angle the paper so that it lies parallel to your child's forearm. Encourage your child to always position the paper correctly before starting a writing exercise. Studies show that handwriting practice should be a part of every school day. However, as this is not often the case due to time constraints, parents can provide opportunities for their children to practice their handwriting at home. Even five to ten minutes per day spent on handwriting until your child can remember how to form the letters reasonably well can make all the difference to your child’s handwriting skills.